As with most spaces in our house, pieces come in and go out based on what projects I’m currently working on. 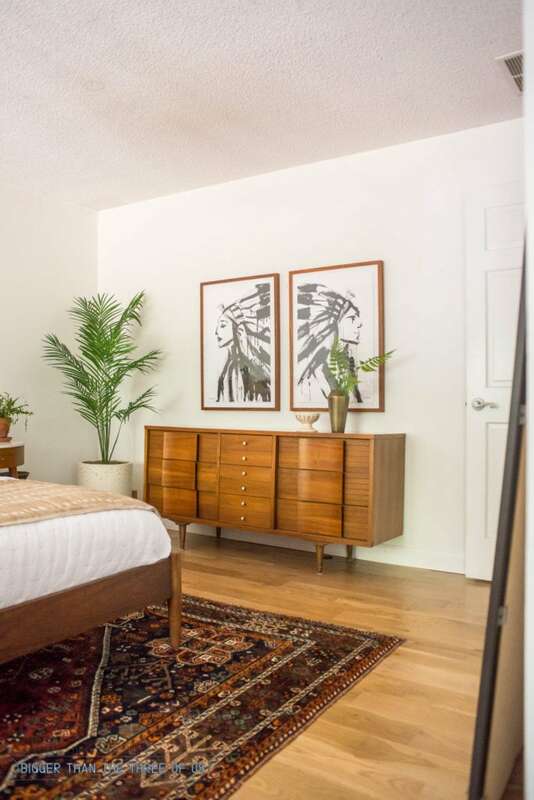 Our Mid Century Modern Bedroom has definitely been tweaked here and there over the past year and a half. 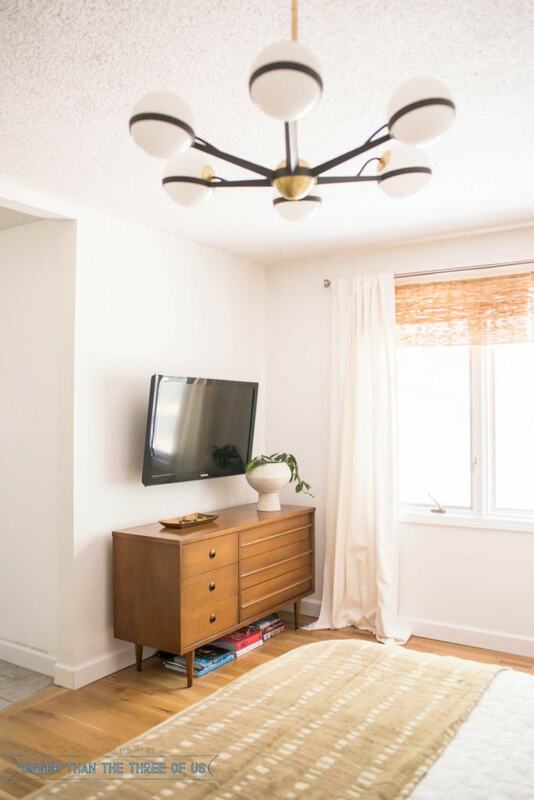 I think I revealed the mid-century eclectic bedroom back in Feb 2017 and, since it’s changed quite a bit, I thought I’d share the current space with you all. The refresh started happening, this time around, because Luke and I decided to upgrade to a king bed. I’m a light sleeper and I realized, after sleeping in hotels on vacation, that I slept better most of the time because I didn’t feel Luke toss & turn or get up. 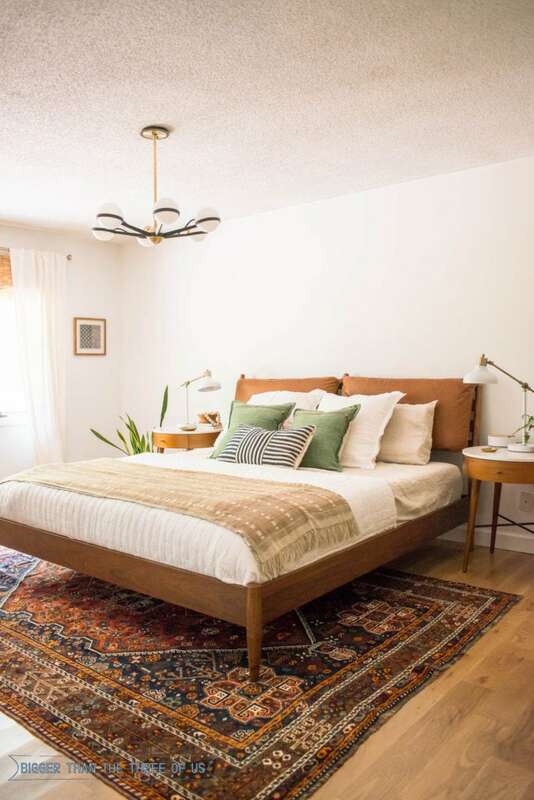 I’ve had my eye on the most beautiful bed from West Elm for quite some time but just couldn’t justify it because, up until this point, we didn’t need a bed. But, when we decided to upgrade from a queen to a king, we needed both a mattress and a bed frame. So, I purchased the bed that I’d been eyeing. It has removable leather cushions on the headboard which I love. 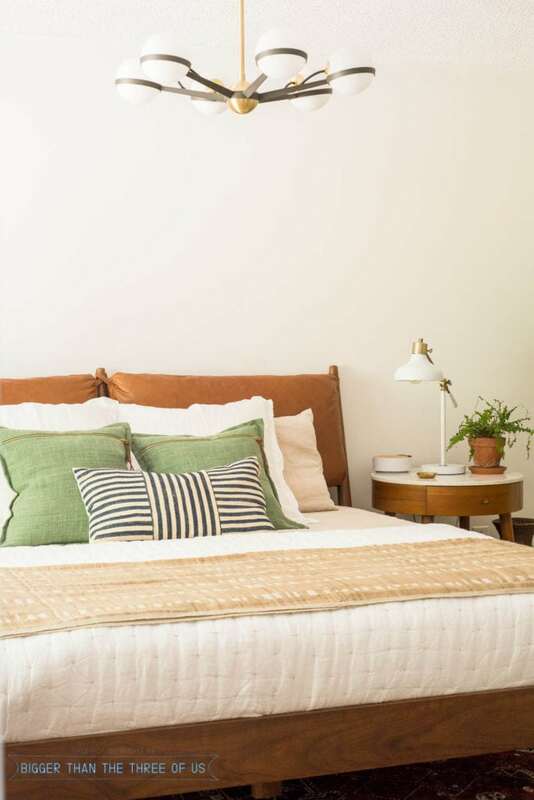 I love the cushions but I also always love to change things up so I’m excited when, a few years down the road, I want a different look and know that I just have to detach the cushions. For the mattress, we partnered with Lucid Mattress. One of my friends has a mattress from Lucid and just loves it so I reached out to them to see if they wanted to provide one for our reveal. I knew I wanted a combo of plush and firm and a mattress that wasn’t going to be hot. After looking through their options, I ended up going with the 10″ latex hybrid mattress. We’ve had it about a month (in the hottest part of the year) and it’s not hot at all! It’s been great, really great. Since we’ve never owned a king sized bed before, we needed all new bedding as well. It’s always super fun to replace the bedding. Actually, maybe you all do it more often than me, but I’ve only replaced our bedding once since we got married (12 years ago)! Is that crazy? Some of the other changes, were just switches from around the house. We recently got a new (well, new to us) media cabinet so we moved the vintage dresser from the living room to our bedroom. We played musical dressers for a few days, between our room and Greyson’s room. I think we finally settled on dressers that work for everyone. I bought the rug awhile ago and have had it in the living room. I really loved it in the living room but it’s way too small for that space. On a whim, I brought the Persian Rug up to the bedroom. Low and behold, I ADORED it in the bedroom! Yay!! 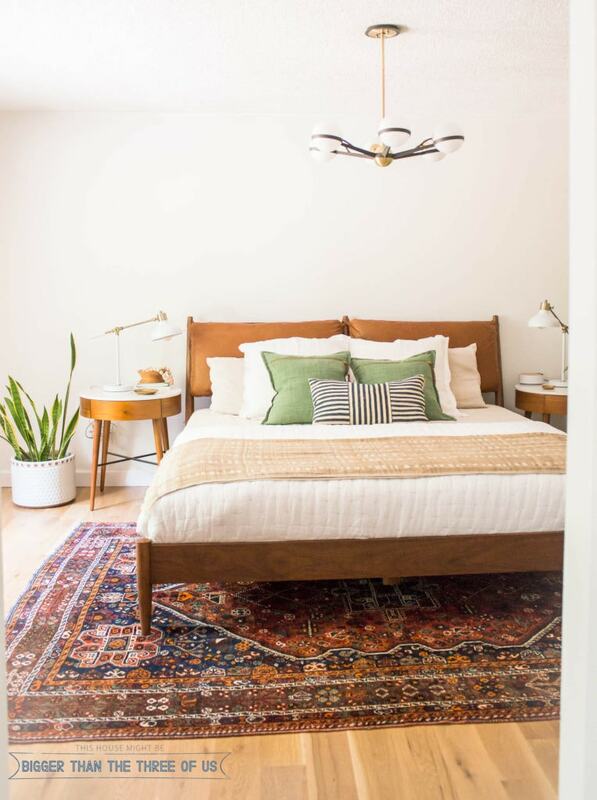 I used my post on how to search for cheap vintage rugs to find that one, so if you are in the market… click over to read! The curtains and the $10 DIY Bamboo shades stayed the same. They are so universal that they go with everything. With the dresser switch, you could really see the cables underneath the dresser that the TV sat over. I’d seen the idea to stack books underneath a media cabinet to hide the cords before and thought it was kinda cute. I went for it! Behind those books, there’s a rats nest of cables and modems and who knows what else! On another note, I didn’t do a great job “hiding all the cords” in this space but I have worked on it before and wrote a really great tutorial for hiding the cords. If you struggle with that, make sure to pop over and check it out. 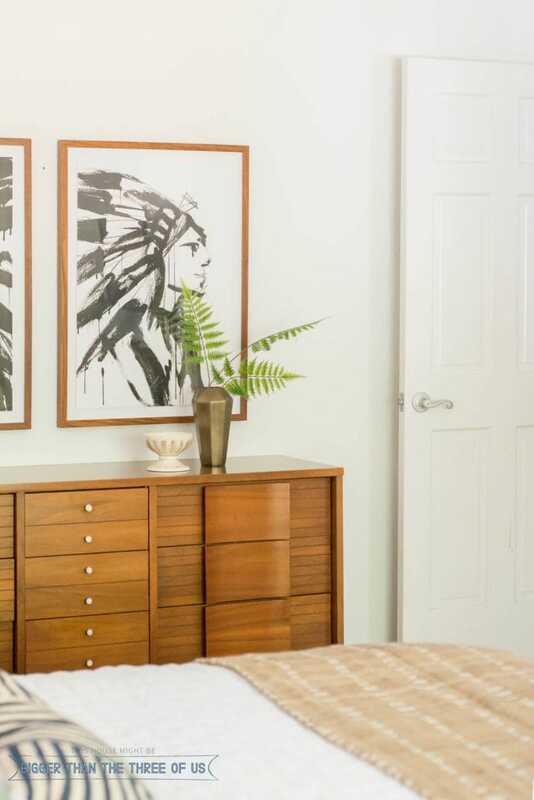 Do you see that fern on my nightstand? It’s not doing well. I’m HORRIBLE at keeping all types of ferns alive. I don’t know what my deal is. I have had this one for about six months, so that is something, but it doesn’t look happy. Anyone have any great fern tips for me? I know they like moisture and indirect sun, but that’s all I’ve got. 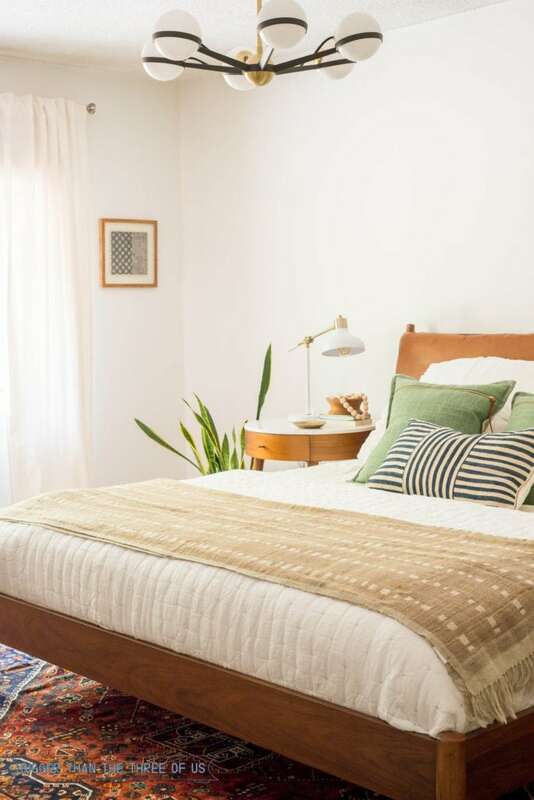 So, what do you think of our Mid Century Modern Bedroom? Do you like this look (the warmer, fall-like tones) or do you like the previous look (the bright blue and white, crisper look) better? I think this one feels much more like us but I will have to say that I did like the other look too! *** Not all sources could be found. I did my best and linked up similar sources for those pieces that were vintage or no longer available.